PhD student John Appleby (left) and Honours student Rob Dykes in a boat on the lake measuring depth with an echo sounder. 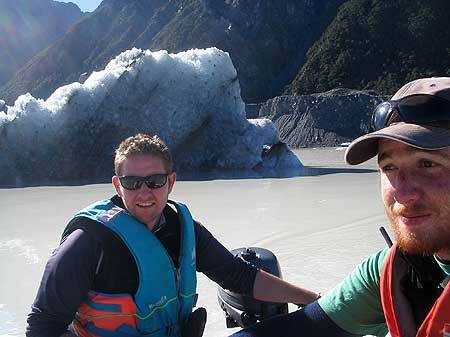 The Tasman Glacier is retreating faster than ever and will ultimately disappear, glaciologists are warning. In 1973 there was no lake in front of the Tasman Glacier, says Dr Martin Brook, lecturer in physical geography in the School of People, Environment and Planning. New measurements taken last week indicate the lake, formed by ice melt from the glacier, is now 7km long, 2km wide and 245m deep. The lake has been formed as the ice which makes up the glacier melts. 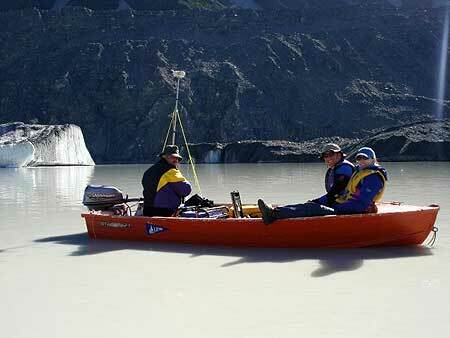 Dr Brook says the lake can only grow to a length of about 16km, which would mean a further 9km of glacier retreat. His work indicated that an extreme scenario for the future retreat of the Tasman Glacier, developed by Dr Martin Kirkbride in the 1990s, was correct. Dr Brook and a number of research students are studying the glacier and the lake using a new towfish sonar and echo sounding equipment to measure the depth and analyse sediments under the lake. “But what is happening now is that a short foot of ice is extending out into the lake away from the ice cliff, and the glacier is now in a period of fast retreat. This is because as the water depth increases so does the speed of retreat – simply, a much larger part of the glacier is submerged and the water, even at only two degrees celcius, is still able to melt the glacier ice. As well as addressing the future of the Tasman Glacier, which is in Aoraki Mt Cook National Park, the team is analysing the newly exposed sub-surface landscape. The project is also interested in the glacier because it is very different to the clean-ice glaciers on the West Coast. Tasman is covered in rock and debris, and has a different relationship with climate, Dr Brook says, as well as different patterns of retreat. Caption: Frome left, technician David Feek, senior lecturer Dr Ian Fuller and PhD student Claire Robertson looking at sub-bottom sediment using the towfish sonar. In the background is a high-precision GPS transmitter attached to the towfish, which gives its location to about 5mm accuracy.